The whole point of play, in developmental terms, is to learn. They may not realise this while they are banging their wooden blocks together or making a tower from Lego, but children are constantly learning and developing through their play. At the same time, children will be honing their motor skills, logic and reasoning skills, and developing language too. As a parent, you’ll want to give them children’s educational toys which stimulate all these abilities. Language and reading skills are just two areas you can help your child, with the right children’s educational toys. 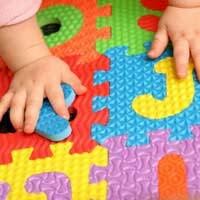 Most baby and infant toys are developed to try and stimulate your baby's visual and auditory senses. Although infants can’t communicate verbally yet, they still learn to make noises that get your attention, and any toys which help with language and communication at this age will help your baby develop into a confident toddler. Reading to a baby from a very young age will be fun with brightly coloured fabric books they can enjoy playing with – and reading the words helps to teach baby the rhythm and inflection of language. It seems that toddlers learn something new every day – words included. Child speech development at this age seems to come in fits and starts - - one day your toddler knows just a few words, and suddenly he will acquire a whole selection! Toys that help develop toddlers' language skills will be children’s educational toys which appeal to more than one of their senses. Letter blocks and simple puzzles with the alphabet on are great for this. Show your toddler how to put the cubes together or make a puzzle of the alphabet, and he'll start to associate letters with the different sounds they make. Complicated electronic toys aren’t essential when it comes to children’s speech development, or children’s reading. Some simple toys that record a toddler’s voice and play it back can be fun – but real talking is infinitely better. With older toddlers and preschoolers, children’s educational toys that encourage reading skills are word games where children learn to spell different words by putting together a picture puzzle. This also helps children to associate written words with objects. Role play toys can be good for toddlers too. Teach your child to interact through dressing up, playing at being a doctor or a fireman (or their favourite cartoon character) with simple role play toys, sets and outfits to play in. At this age, electronic toys start to become more useful for teaching language and writing skills. Children’s educational toys should be geared towards building their vocabulary, children’s reading, and spelling. Make sure that any electronic children’s educational toys that you choose, actually encourage children to take part in a game, not just fill in the electronic version of a written worksheet – this will get very boring very quickly! Games that encourage your child to think about their world, exploring new words will enhance his language skills at this age. Language learning toys, like all children’s educational toys, tend to work best if you also focus on talking (and listening) to your child, asking lots of questions and giving them an interest in communicating with you and with others.